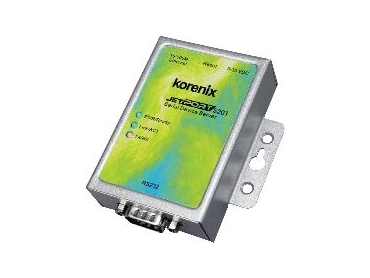 KORENIX’S newly released JetPort 5201 single port RS232 serial device server breaks the industry record of serial to Ethernet performance by achieving maximum 460.8kbps serial speed, in full duplex. The product design breaks traditional serial to Ethernet performance that can only achieve 230.4kbps or lower and offers users greater flexibility to plan the system. The JetPort device server provides a transparent data gateway from serial to Ethernet and vice versa. Users can use TCP/UDP sockets or Windows COM/Linux tty driver to transmit data without modifying the original controlling programs. JetPort provides flexible configuration options including Windows utility, Web console and telnet console. The JetPort commander is a JetPort Windows utility that can configure and monitor single or multiple JetPort units at the same time. For remote management, JetPort can send email and SNMP trap to notify device or port events, such as Access IP blocked, or Port disconnected. * Fixed TTY driver for Linux.